Groceries can get expensive. If you Google how to save money on groceries, many sites offer the same advice – use coupons. But what if you want to know how to save money on groceries without coupons? Is there a way to lower your grocery bill without spending hours scouring through newspapers and the Internet? Of course there is! My family of three is able to eat well on around $400 a month and that’s without clipping a single coupon. That total also includes toiletries, so in reality, we only spend around $350 on food. 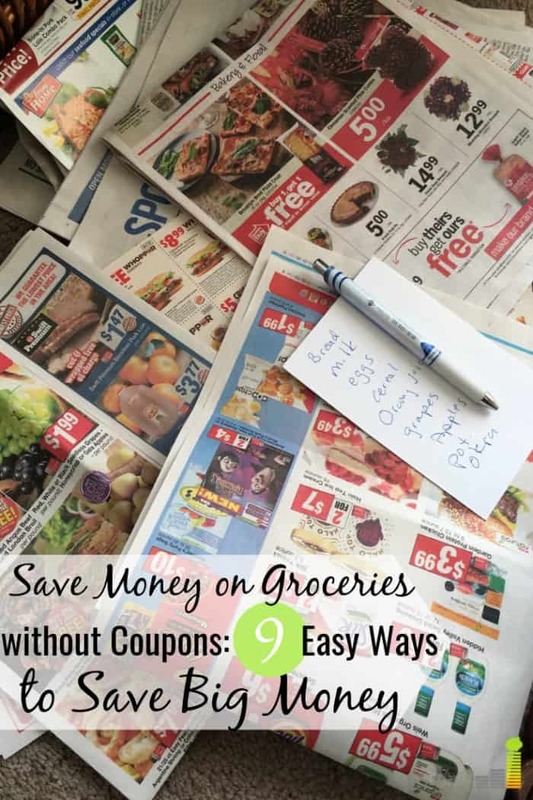 If you want to save money on groceries without clipping coupons, it is possible. It’s not as difficult as you might think and you can save significant money in the process. The average family of four spent close to $650 per month on food in 2017, according to the Bureau of Labor Statistics. That takes up a significant amount of your budget, especially if you’re on a limited income. If you want to know how to save money on groceries without coupons, try a few of these methods to save money at the store. We know these stores very well, and we know what they have to offer and for what prices. Because we’ve studied and shopped at these stores so frequently, we know what we can buy, how often it goes on sale, and where the best prices are for any item we typically keep stocked in our home. For example, I know that Aldi has the best prices for beans and pasta, but Sprouts has the best prices on fruits and bulk items like quinoa. Our local Asian market stocks our favorite hard-to-find items like fresh rice cakes, and for a steal. How many times have you walked into an unknown store and found yourself buying items you don’t need or at a higher price than your normal store? If you know the stores around you well, you’ll save time and energy stocking up on the items on your grocery list. This is key when trying to save money on groceries without clipping coupons. Along with knowing which stores you will frequent the most, you need to know their sale cycles. You can typically find the flyers of your favorite stores by looking online or grabbing their flyers when entering the building. For my family, we know that Aldi sales start every Wednesday, Sprouts has double ad Wednesday (where you can use both weekly ads and you get double the discounts), and our Asian market discounts all the fruits and veggies on Mondays. This works for me because I can pop in during these times and buy the items my family needs. Also, make sure you know how the sale cycles work for each store. For example, my local Aldi has a sale on their vegan meats every six weeks. Because my family is vegan/vegetarian, we take advantage of these sales and stock up on our favorite items, and then use them for the next six weeks (when the sales start again). A lot of people take their phone with them everywhere, including the grocery store. So why not put it to use? I know that these are tips on saving money on groceries without coupons, but digital coupons and apps don’t really count in my opinion. You don’t have to do any extra work to enjoy the savings (besides the initial work of downloading the app). Below are some of the best apps to save money on groceries. Ibotta is one of my favorite grocery rebate apps. It offers you cash back on the items that you’re already buying. To use it, simply input your ZIP code in the app, look at the offers they have for the week, and select the ones that you want to use. Once you buy those items, take a picture of your receipt, and earn your cash back. It’s really that easy. Many of the offers work on both brand name and generic items. Ibotta also has a low payment threshold. You can transfer the money you earn to your PayPal or Venmo as soon as you reach $20. The app starts you out with a $10 bonus for opening an account. Check out our Ibotta review for a more in-depth review of the service. Shopkick is another great app to save money on groceries, and I love using this one to earn “points” (also called “kicks”) that I can redeem for gift cards or convert to cash. The app is available for both Android and iOS devices. The best part of Shopkick? You don’t even really have to buy anything to earn points. While you will earn more kicks when actually buying items, you don’t have to. Shopkick also has a low payment threshold, and you can request cash, a transfer to your PayPal, or a gift card once you’ve reached $20. BerryCart is the ultimate app if you generally buy natural, organic, non-GMO, vegan or vegetarian foods and drinks. Your favorite items like almond milk can mean extra savings for you. To earn your rewards, you complete actions such as answering polls, tapping an icon, or taking pictures of your receipts. They even give you a whole week to upload receipts, so you don’t have to rush to take pictures if you’re busy. Once you’ve reached $5, you can transfer that money to PayPal, or request a gift card. While Ibotta is the most well-known of apps to save money on groceries, don’t overlook the best apps like Ibotta to increase your savings. I’m not saying to completely give up red meat or chicken. But meat is expensive. Many people in our society have grown up with meat as a focal point of the dishes they create. However, as time has gone on, meat prices have increased, making it more difficult for many families to afford it. Plus, with the worries of GMOs, hormones, and the treatment of animals, people are spending more to get higher-quality meat. Did you know that organic and grass-fed beef can run you anywhere from $4.99 per pound to $12.99 per pound? Yeah, that’s insane. So instead of eating meat with every meal, every day, try to have one to three meatless meals every week. For example, one night you could make lentil sloppy joes, and for breakfast, you could make fruit parfaits. Delicious, nutritious, and cheap! Have you ever gone into a grocery store and bought everything under the sun, only to get home and realize you already had those items? Or worse, you buy everything and then it goes to waste in your fridge. Food waste is real, and it increases your grocery budget. Reducing food waste is one of the best ways to save money each month instead of throwing it in the trash. While this schedule keeps it simple, it also allows room for creativity and makes it easy for you to pick meals that follow the particular themes each week. If you don’t know where to start with meal planning, try $5 Meal Plan. The service gives you a free 14-day trial and teaches you to effectively plan meals, what to buy at the store, and save money. Do you know what fruits and vegetables are in season in your area? Do you know that you could save a ton of money (and get better-tasting fruits and veggies) just by shopping what’s in season? Let’s say you live in Kansas. Corn is typically the most plentiful in the summer and early fall. And guess what happens when it’s in season? It can drop to less than one dollar for four ears of corn. Now, if you plan your meals around corn, you could stock up on a basketful, and most likely spend less than $10. All of those dishes can be created with such a simple, and cheap, ingredient because you shopped in season. If you had a blind taste test, where you tasted the generic canned beans and the name-brand canned beans, I can almost 100 percent guarantee you that wouldn’t know the difference. It’s one of those items where name brand doesn’t matter. Find other items you can do the same with and you can increase your savings. The only item that I buy name brand is cereal, and that is because my child is super picky on her favorite cereals. But other than that, if you opened up my cabinets, you’d see nothing but store brand items. Shopping generic only has saved us hundreds (if not thousands) of dollars over the years. It’s a great way to save money on groceries without coupons, and even without shopping sales. Speaking of keeping things simple, make your meals simple, too. You don’t have to serve a full four-course dinner every night. You don’t have to make a hot breakfast for the kids every morning. 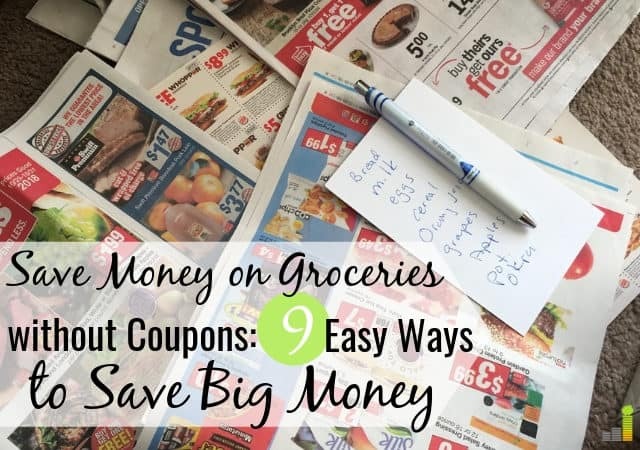 A key to help you save money on groceries without clipping coupons is to keep it simple. Spaghetti can be three ingredients — pasta, pasta sauce, and protein of choice. Breakfast for dinner can be a few eggs and boxed pancake mix. By keeping your meals simple, you can keep your grocery list small, thus saving you more money. Those recipes with 20+ ingredients can be saved for treats or as dining out alternatives, but you don’t have to do that every single day. If you plan your meals wisely, they can also be a great way to get healthy on a budget. One of my favorite ways to save money on groceries without coupons is to not buy pre-made snacks. While my daughter has her favorites, we tend to make everything from scratch. And it’s easier than you may think. Every week after buying groceries, I give myself an hour to prep the snacks that my family will eat throughout the week. For instance, I’ll pop some popcorn and put it in individual grab bags. Or I’ll prep some yogurt and homemade granola in separate mason jars. I’ll even cut up fruits and veggies I know won’t go bad easily and put them into individual jars as well. And for my daughter’s favorite, I cube a block of cheese, slice some veggie dogs, and add some crackers for her to create her own “Lunchables”. By buying these items and prepping them myself, I save quite a bit of money. For example, store-bought Lunchables costs $1.00 each. Pre-made veggie and fruit trays can run anywhere from $10-$20 per tray. Want to know how much I spend on our weekly snacks? Less than $10 combined. And my daughter gets to happily snack on all of her favorite foods. It is possible to save money on groceries without coupons, and my family is proof. You don’t have to sacrifice time, money, and energy just to feed your family and eat a nutritious diet. Follow the above tips and you start saving money quickly and easily. What are some other ways you save money on groceries without coupons? What’s one struggle you encounter in trying to lower your grocery bill? How much do you spend on groceries each week?